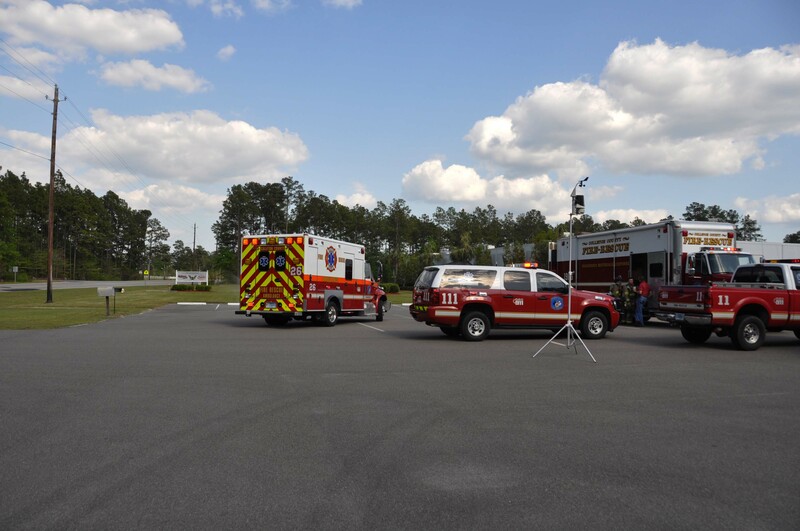 The Fleet Management Department and Logistics Division spent the week of 28-April conducting the annual pumper testing at headquarters. Several off-duty firefighters assisted in moving the 34 Engines, two Ladders and ARFF over the four days it took to complete the job. The crews started at day break each morning and worked until around 1900. Click here for additional information. Stations 5, 9, 11, and 19 responded to a structure fire at 329 Whites Aves north of Cottageville at 0933, Thursday 29-April. Engine 9 and Medic 9 we originally dispatched to a woods fire reported to be near this location. 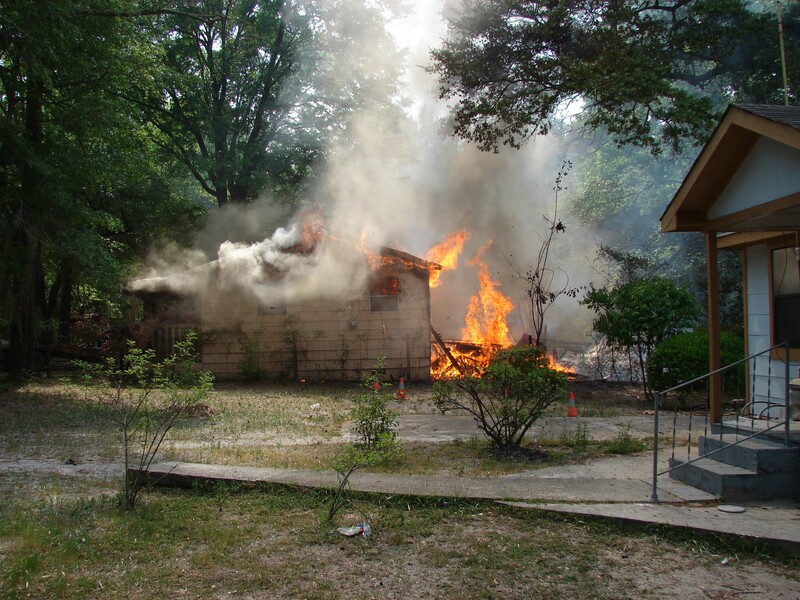 On their arrival, firefighters found an approximately ½ acre woods fire and an older mobile home completely burned down. Click here for additional information. 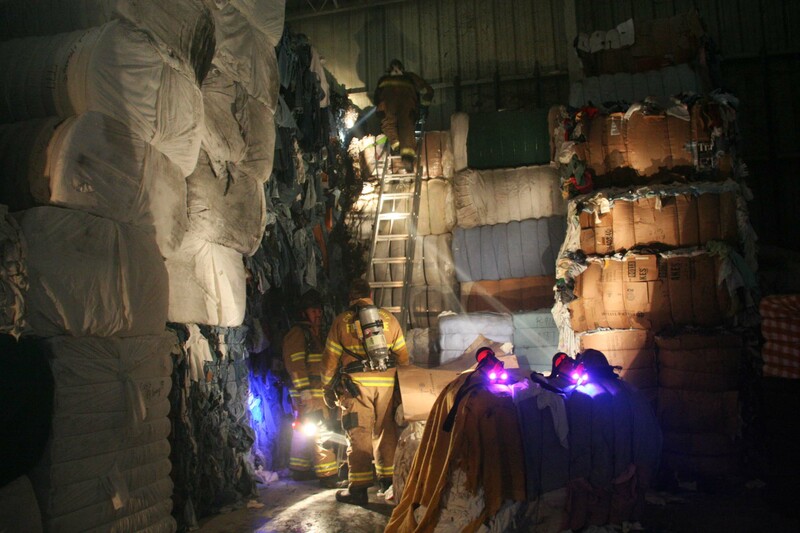 Stations 1, 19 and 26 responded to a fire at the Carolina Textile Recycling Facility located at 68 Anderson Road at 0832, Tuesday morning 27-April. The 45,000 square foot building houses a clothing recycling company that shreds and packages old clothing to make rags for various industries. They also operate a large used clothing outlet in an attached addition. Click here for additional information. Stations 5, 9, 11, 19, 26 and 27 responded to a residential structure fire at 18843 Augusta Hwy at 0142, Tuesday morning 27-April. Engine 9 arrived to find a singlewide mobile home approximately 60% involved. Firefighters deployed two 1-3/4 handlines, making entry through the front door. They had the fire knocked down within 15 minutes... click here for additional information. Stations 1, 19 and 27 responded to a single car high speed MVC in the 1300 block of Sidneys Road at 1347, Monday afternoon 26-April. 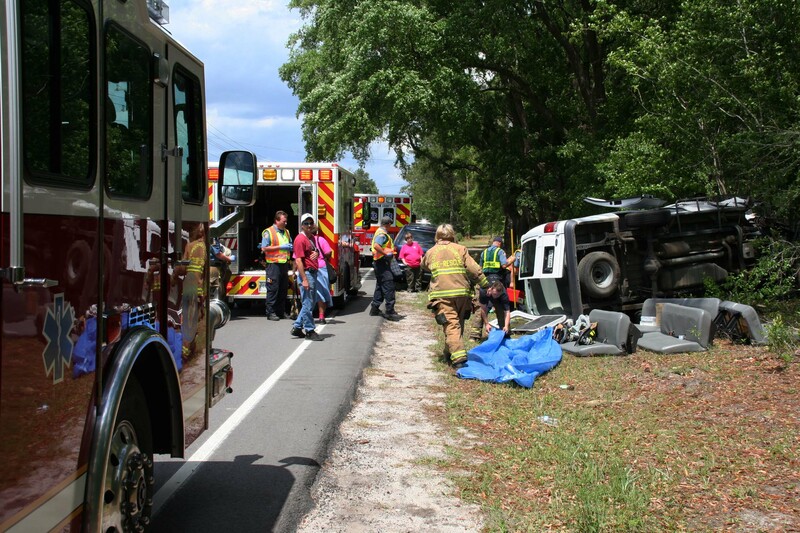 A full size Ford passenger van left the roadway, crossed a ditch and struck a large pine tree, before over-turning, trapping the five female occupants. Engine 19’s crew was able to force entry through the rear doors to access the patients.Click here for more info. 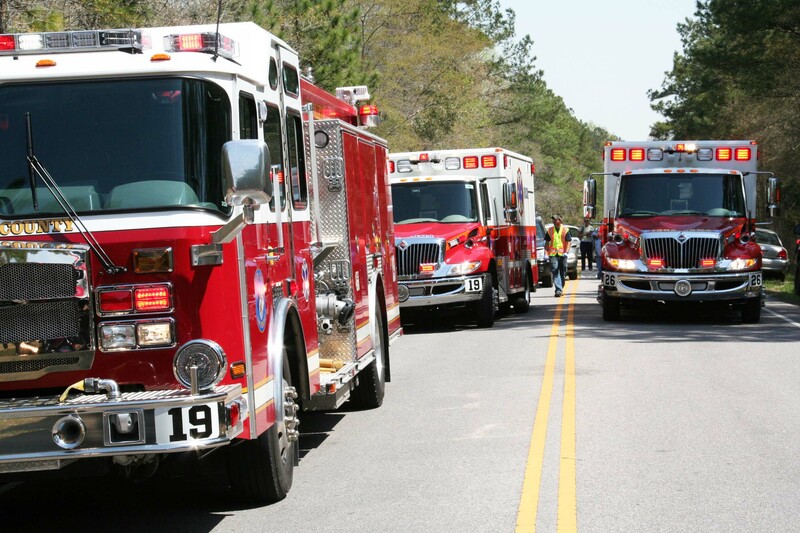 Fire-Rescue participated in the 34th annual Rice Festival Parade held Saturday morning 24-April in Walterboro. 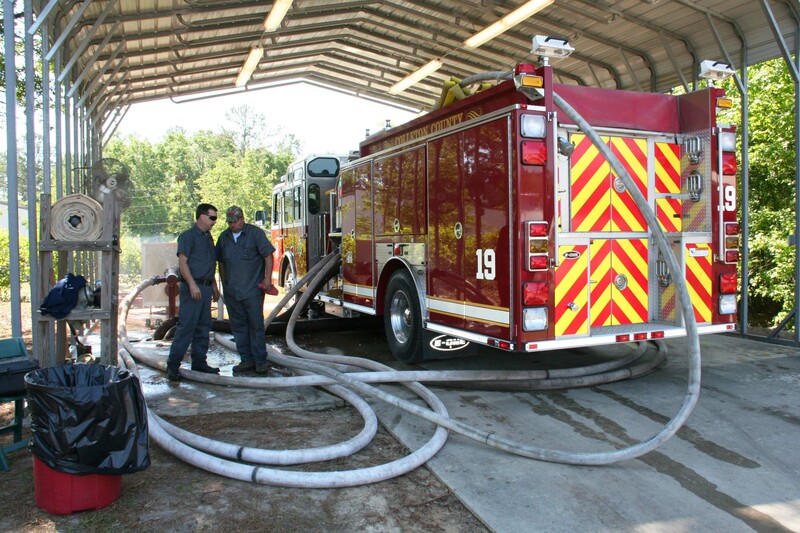 Firefighters from several stations polished and cleaned their apparatus days in advance, to show them off to the community. Despite light rain, a large crowd of people turned out for the 2-1/2 mile long parade which started from South Jefferies Blvd at DeTreville Street. Click here for more info. Stations 1, 5, 17, 18, 19, 26, and 27 responded to a two alarm structure fire at 719 Quail Drive at 1221, Friday afternoon 23-April. Quail Drive is currently closed in the 600 block due to bridge construction. The construction crew notified 9-1-1 that they could see smoke and flames coming from a house near their location. Click here for additional information. Stations 3, 4, 7, 18, 23 and 31 responded to a structure fire at 4030 Lumber Road at 16:39, Thursday 22-April. Initial reports to 9-1-1 were confusing as to what was actually on fire or how long it had been burning. Engine 7 and Engine 18 arrived together to find a large single story wood frame structure fully involved. Click here for additional information. Stations 5 and 26 responded to a high speed single vehicle MVC on I-95 at the 68 mile marker northbound at 2050, Monday evening 19-April. 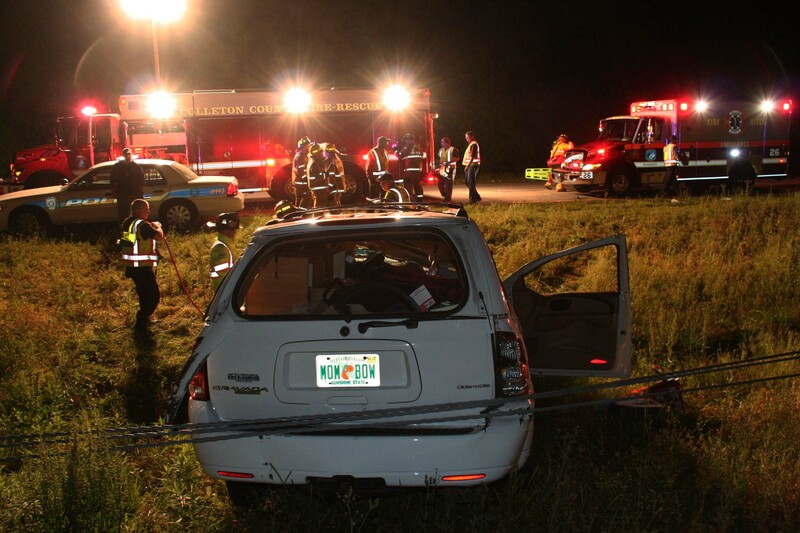 The small SUV left the roadway, entered the median and over-turned three times before coming to rest upright against the cable barrier. The female driver suffered multiple non-life threatening traumatic injuries... click here for additional information. 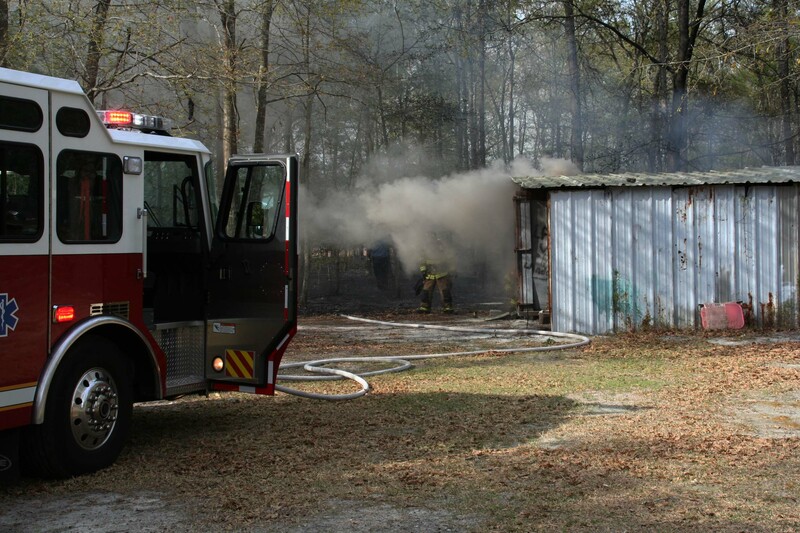 Stations 8, 15, 18, 29 and 31 responded to a structure fire at 1133 Shiloh Loop Monday afternoon 19-April at 1558. The caller to 9-1-1 reported a yard debris fire had gotten out of control and spread through the yard to an older vacant dwelling. The home was reported to be well involved. The caller also advised an elderly woman was attempting to fight the fire. Click here for additional information. 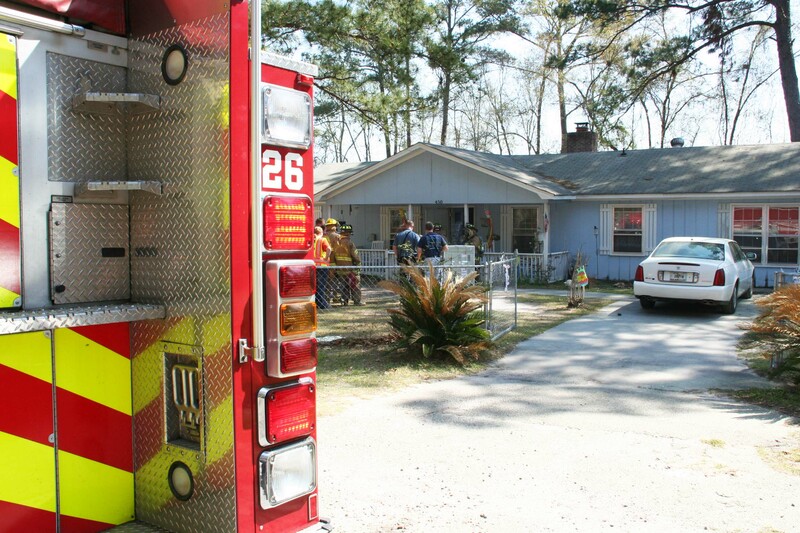 Stations 1, 19, 24, 26 and 27 responded to a house fire at 20 Taylor Street at 1502 Saturday afternoon 17-April. An undetermined person was demolishing an abandoned structure on the property next to this home. They had knocked the building down with a backhoe and was burning the debris in a pit which had been dug on the property. The fire was left unattended and spread through the yard until it reached the house at 20 Taylor Street. Click here for additional information. Stations 1, 19 and 26 responded to a second Carbon Monoxide leak within the last week at the American Body Builder's Bottling Plant located at 1756 Industrial Road Monday afternoon 14-April at 1602. 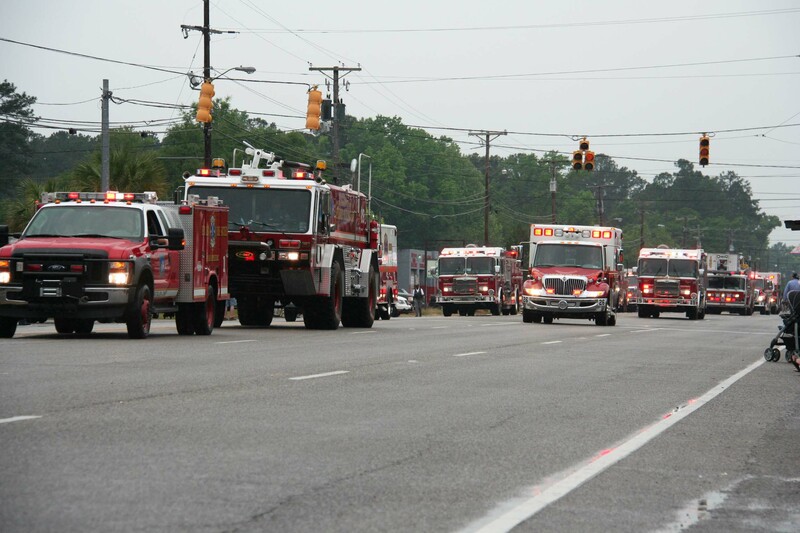 Engine 19 and Medic 19, who were returning from a house fire, were driving near the plant and arrived within a minute. Click here for additional information. 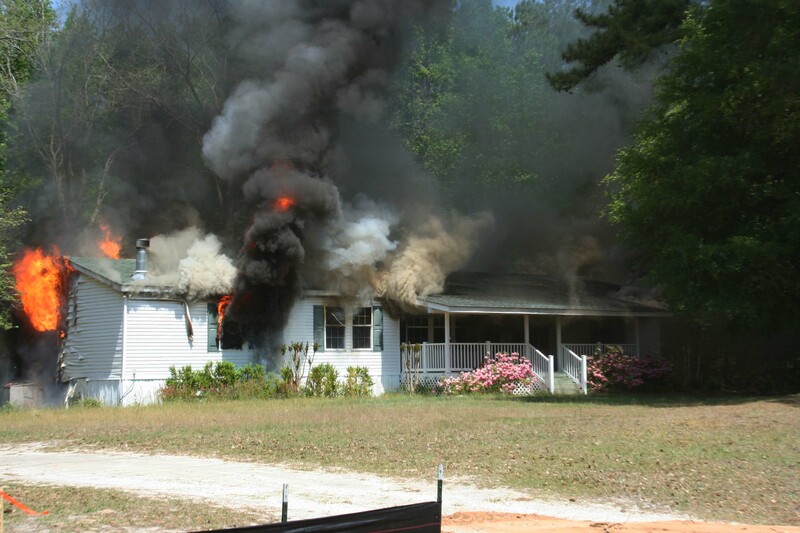 Stations 5, 9, 11, 19, 26 and 27 responded to a house fire at 15299 Round O Road at 1417, Wednesday 14-April. Engine 19 arrived within 8 minutes, but found the singlewide mobile completely on the ground. A one acre woods fire was also burning. 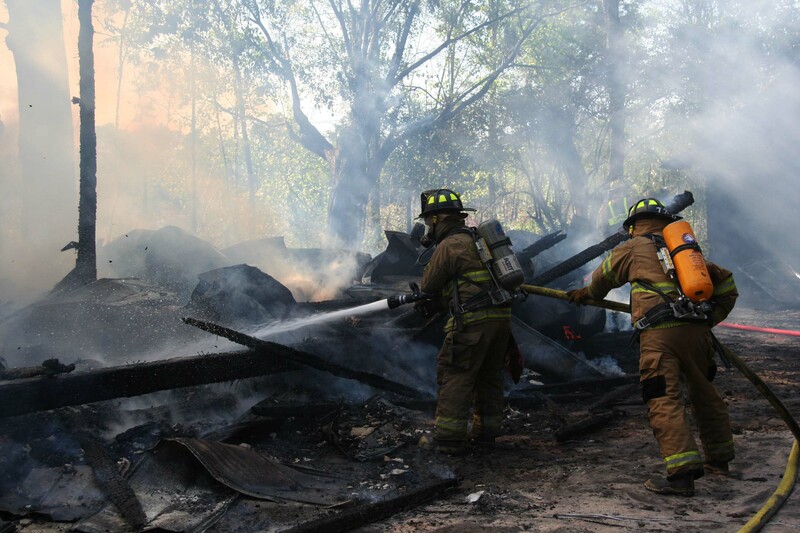 Firefighters deployed two 1-3/4 handlines to combat the fires and extinguish the remains of the mobile home. Click here for additional information. 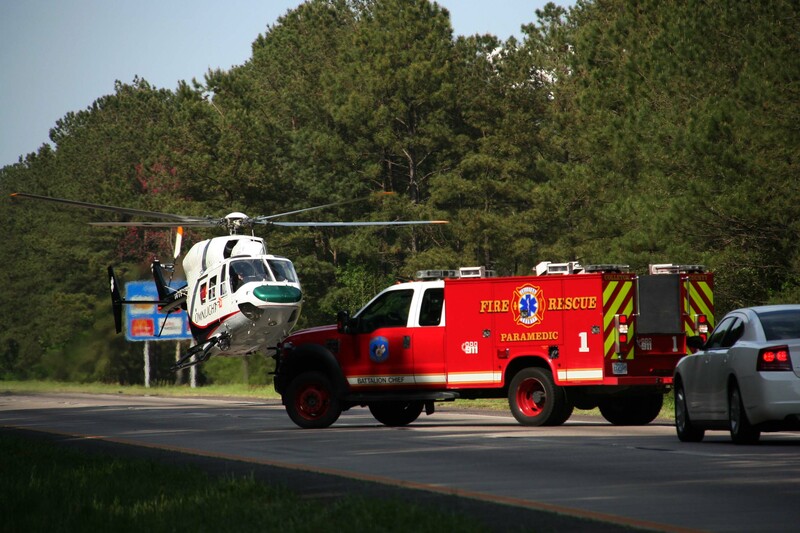 Stations 1, 5, 17, 19 and 27 responded to a three vehicle accident on I-95 at the 68 mile marker northbound, Tuesday afternoon 13-April at 1705. 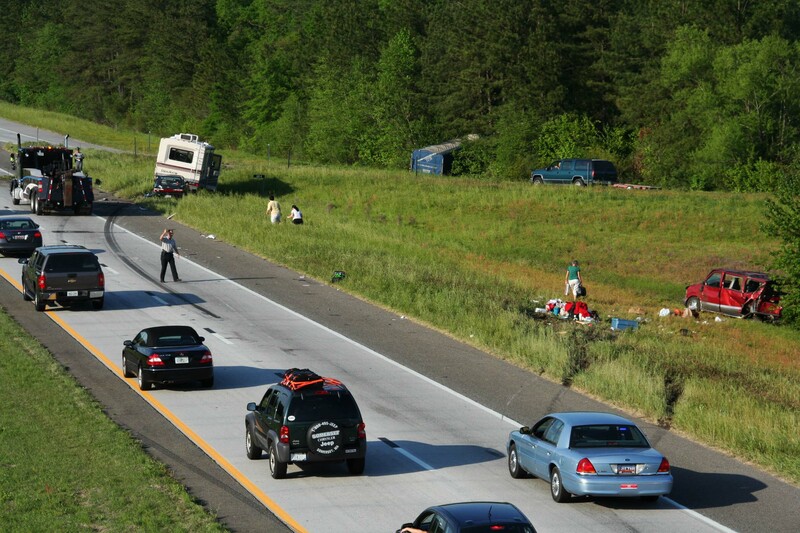 Traffic on the busy highway had begun to slow due to an accident at the 74 mile marker in Dorchester County. A north bound tractor trailer came up behind several slowing vehicles, striking a mini-van in the rear... click here for additional information. 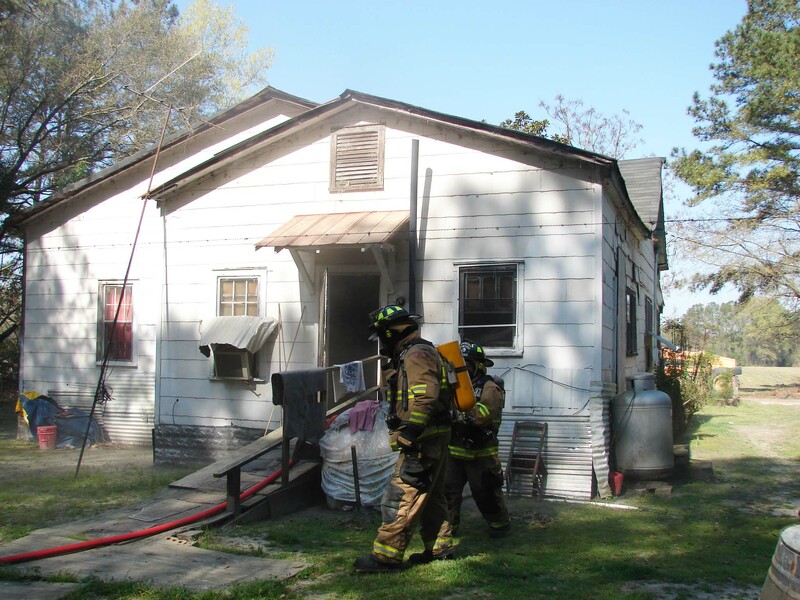 Six Colleton County and four Walterboro Public Safety Officers were among 17 students to complete the Basic Firefighter Course # 1152. 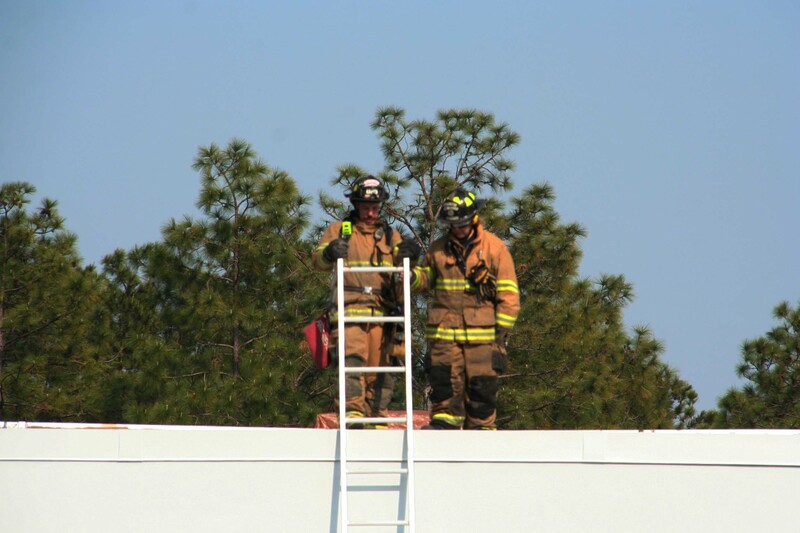 The final practical exam was administered Saturday 10-April at the SC Fire Academy in Columbia. The candidates and Instructors met up with another class from Saluda to began the evolutions at 0830. Click here for additional information. 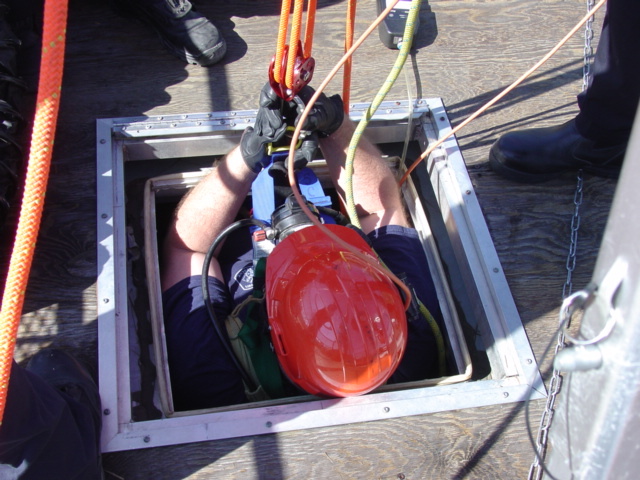 Sixteen Firefighters participated in a week of Confined Space Rescue training held in the county. The two classes, course number 3310 – Confined Space Entry Operations and number 3392 – Confined Space Rescue 1, were taught back to back during the first week of April. All participants completed the 40 hours of training, along with firefighters from Mount Pleasant and Old Fort Fire Departments. The classes were taught at Station # 19. Click here for more informaiton. Stations 19 and 26 responded to a Carbon Monoxide leak at the American Body Builder's Bottling Plant located at 1756 Industrial Road Monday afternoon 12-April at 1538. First arriving units found the plant being evacuated and an audible alarm from inside. The first in entry team found over 180 ppm of Carbon Monoxide in the plant. Click here for additional information. Stations 9, 18, 19, 26, and 27 responded to a three vehicle MVC at the intersection of Robertson Blvd and Jefferies Hwy Saturday afternoon 10-April at 1734. An unmarked Sheriff’s Office cruiser was struck in the passenger side by a Nissan Sentra causing both vehicles to spin around, coming to rest at the north west corner of the intersection. Click here for additional information. 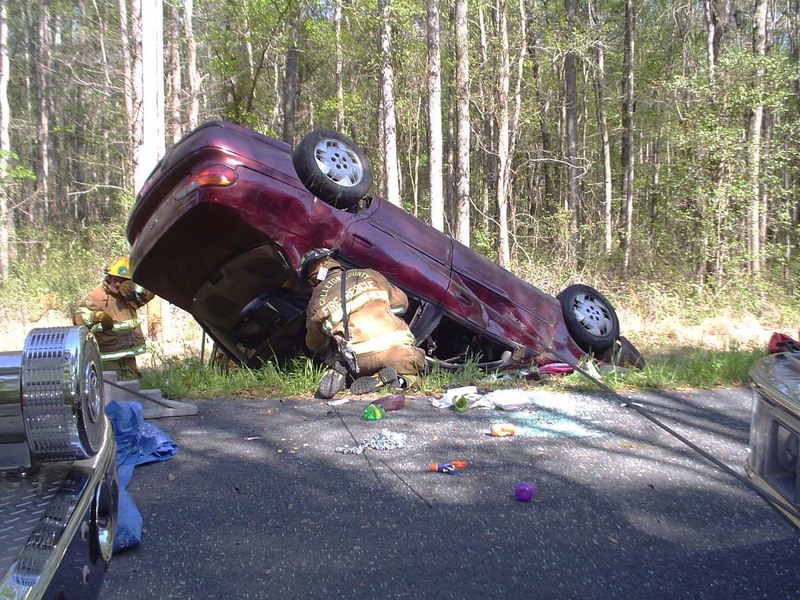 Stations 6, 12 and 19 responded to a high speed single vehicle MVC on Charleston Hwy at Featherbed Road Saturday afternoon 10-April at 1713. Witnesses advised a 2000 Toyota SUV swerved to avoid striking another car, when the driver lost control. The Toyota overturned three times coming to rest on its wheels. The SUV then caught fire. An unrestrained passenger was ejected from the car and suffered critical multiple traumatic injuries. Click here for more info. Stations 19 and 27 responded to a two vehicle MVC at the intersection of Robertson Blvd and Barracada Road, Saturday morning 10-April at 0831. Engine 19 arrived to find one over-turned SUV in the woods and a pick-up truck on the shoulder. The SUV suffered heavy damage and may have rolled more than once. Click here for additional information. Stations 1, 8, 19, 26 and 27 responded to a two vehicle MVC on I-95 at the 43 mile marker northbound at 0752, Friday morning 9-April. The driver of a northbound Yukon stated she fell asleep, causing the vehicle to drift off of the roadway. The driver over-corrected when bringing the SUV back on the highway, then lost control. Click here for additional information. 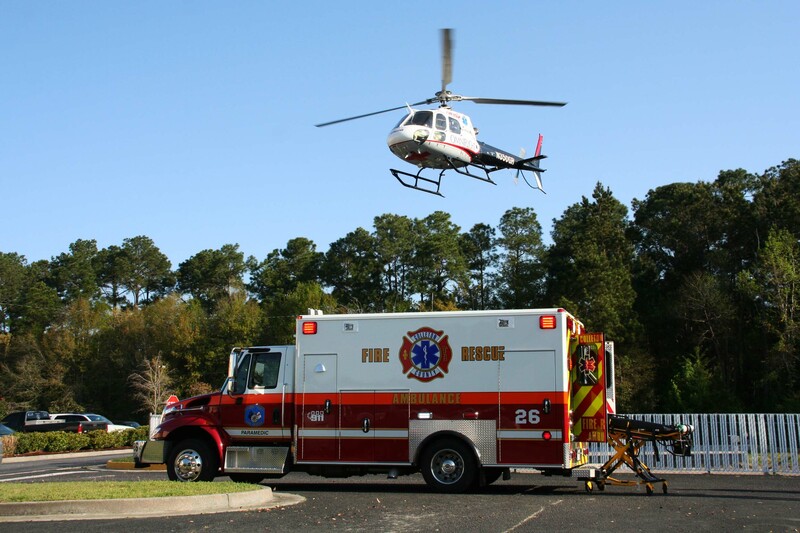 Our condolences go out to the Mixson family at Station 23 for the passing of Eli Mixson, Jr. Mr. Mixson is the father to Fire Commissioner Doug Mixson and the grandfather to Station 23 Captain Doug Mixson, Jr. Visitation will be held at Brice Herndon Funeral Home – Varnville SC from 6pm – 8 pm Friday evening. The Funeral will be held at Brice Herndon Funeral Home – Varnville SC at 3 pm on Saturday. Stations 1 and 27 responded to a single car high speed MVC on I-95 at the 53 mile marker northbound at 15:24, Wednesday 7-April. The 2004 Chrysler Pacifica lost control and entered the woods on the right hand shoulder. The vehicle struck several trees. 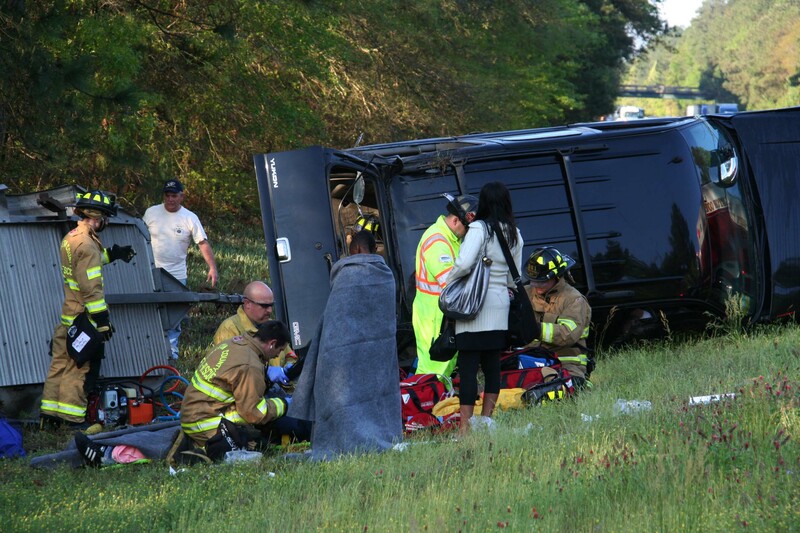 The front seat passenger received multiple traumatic injuries and was trapped in the wreckage. Click here for additional information. 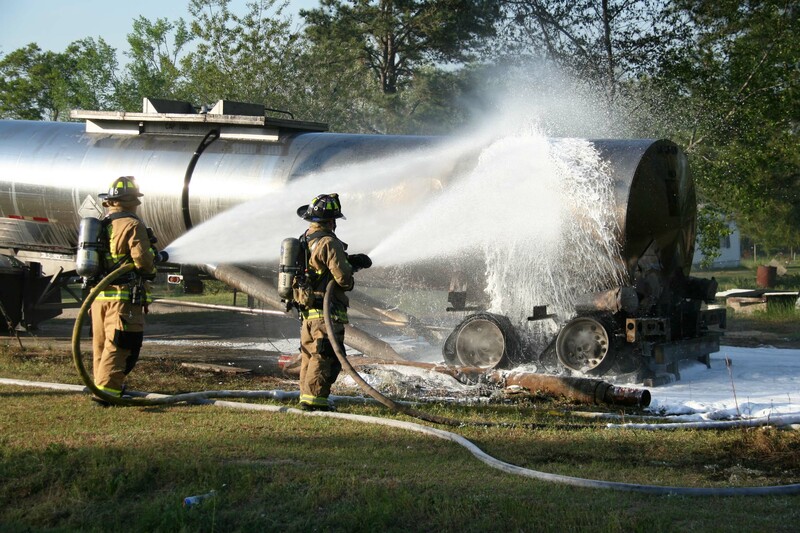 Stations 5, 17, 19 and 26 responded to a report of a gasoline tanker on fire in the 11000 block of Augusta Highway at 1736, Tuesday afternoon 6-April. On arrival Engine 5 reported a well involved, tractor trailer tanker truck on fire, with several acres of woods also on fire. He noted it did not appear to be a gasoline tanker and the trailer had no placards. Click here for additional information. Stations 1, 15, 18 and 26 responded to a high speed single vehicle MVC on Rum Gully Road north of Sniders Highway, Monday afternoon 5-April at 15:37. The compact car lost control in a curve, overturning at least once. 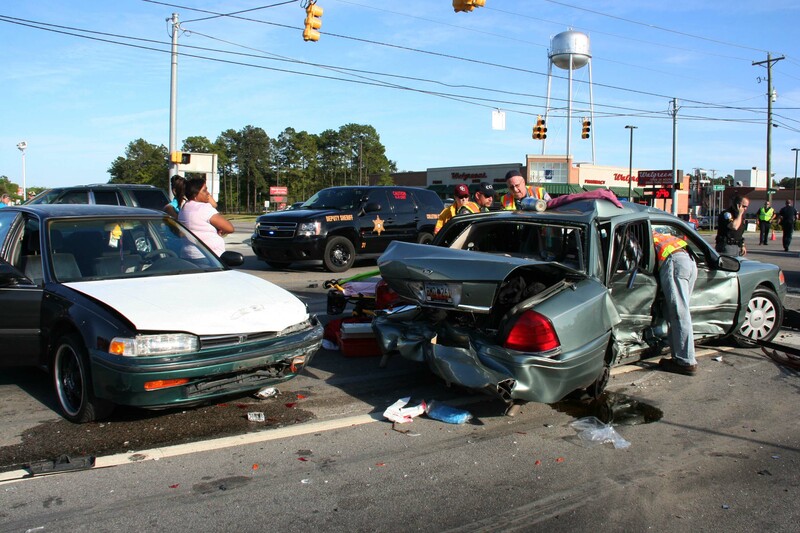 Two adult females in the vehicle were injured, one critically. 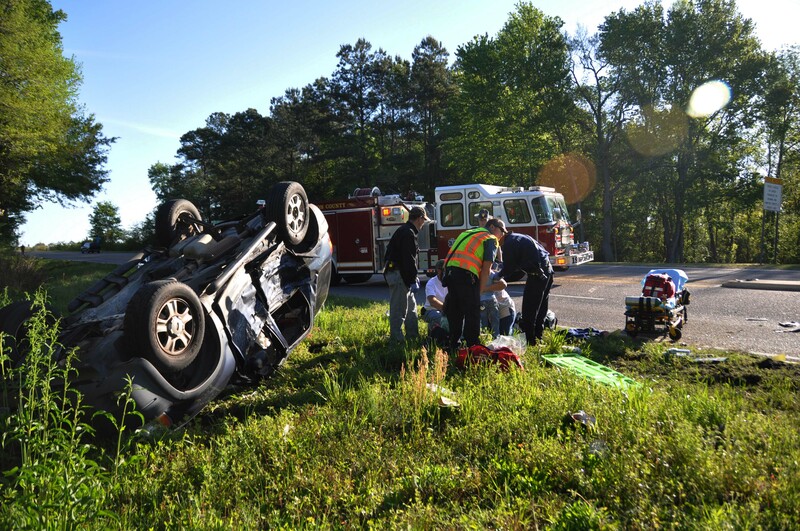 The critical patient was not wearing a seatbelt and was partially ejected, resulting in a near amputation of her right leg, as well other traumatic injuries. Click here for additional info. Stations 1, 26 and 27 responded to a single car high speed MVC on I-95 at the 49 mile marker northbound Monday morning 5-April at 0722. The driver reported she was arguing with her boyfriend, when he grabbed the steering wheel causing the vehicle to leave the roadway. The small Chevrolet Cavalier rolled over multiple times before coming to rest on its wheels...click here for additional info. Stations 1, 4, 26 and 31 responded to a reported structure fire at 137 Joye Street Sunday evening 4-April at 2057. 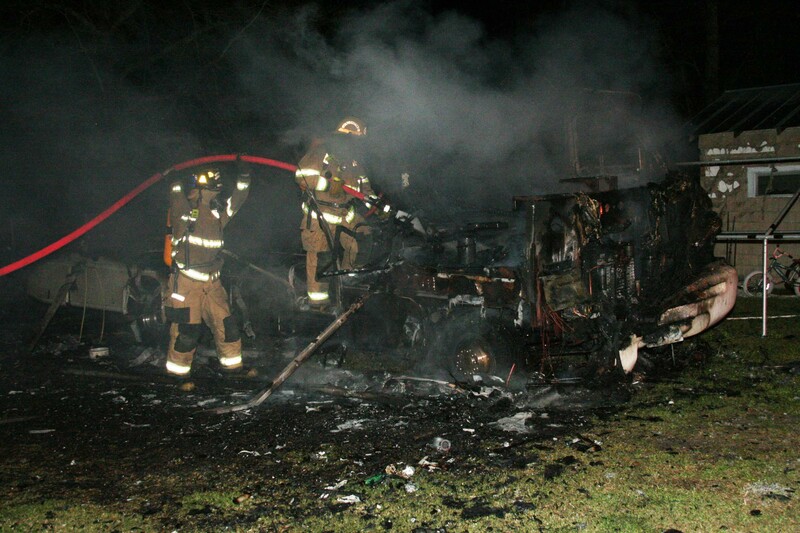 On arrival, Engine 4 found a fully involved motor home parked next to a one story work shop. The homeowner advised there was power to the motor home. Firefighters isolated the power and used one 1-3/4 handline to extinguish the motor home... click here for additional information. Stations 1, 6, 8, 25 and 27 responded to a structure fire at 6539 Combahee Road at Cherokee Plantation Sunday morning 4-April at 0939. Engine 8 arrived to find a 300 x 30 foot building with fire coming from the roof approximately 50 feet from the north end of the building. A portion of the roof had already collapsed. Click here for additional information. 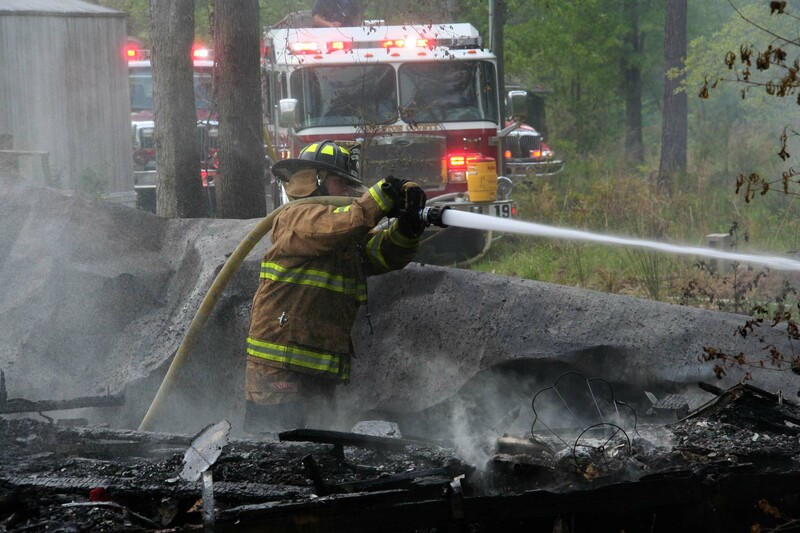 Stations 1, 5, 19, 24 and 26 responded to a structure and woods fire on Calloh Drive at the intersection of Blevins Drive in the Lafayette Park Subdivision, Saturday afternoon 3-April at 1641. The woods fire had grown to cover approximately four acres before it was reported. The fire burned into several yards damaging a wooden privacy fence at one home... click here for additional information. 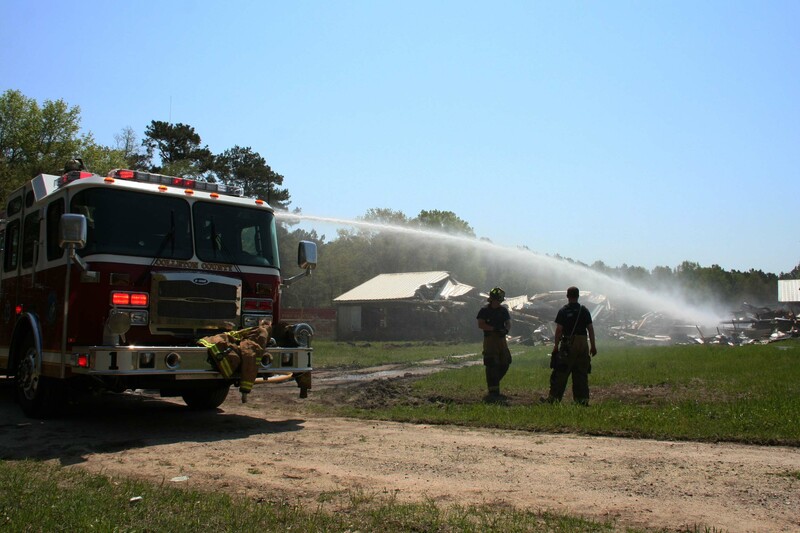 Stations 1, 6, 12, 19, 22 and 27 responded to a structure fire at 3463 Green Pond Hwy at the Walterboro Veneer Plant at 0154, Saturday morning 3-April. 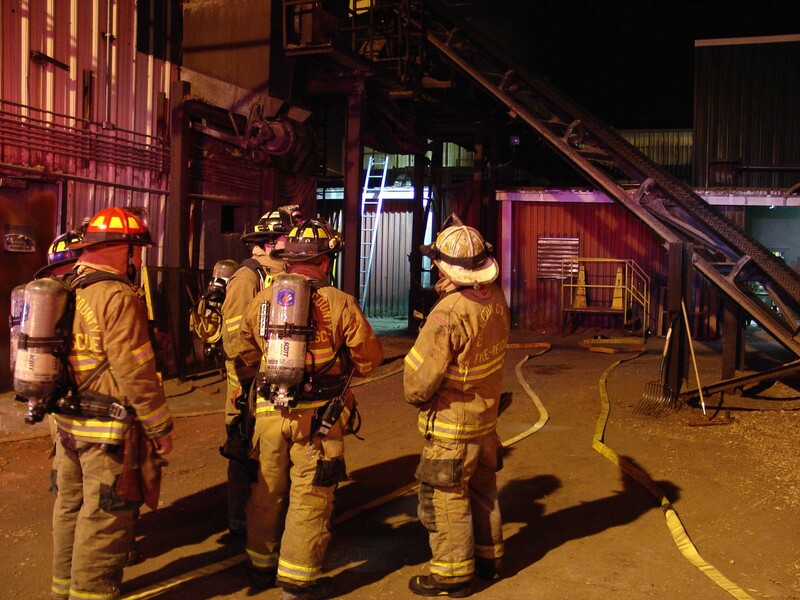 Plant security personnel reported a fire in the ceiling in the main building at the wood products company. Security personnel used several ABC extinguishers in an attempt to extinguish the fire. Engine 19 arrived to find smoke coming from the roof with several smoldering fires... click here for additional information. 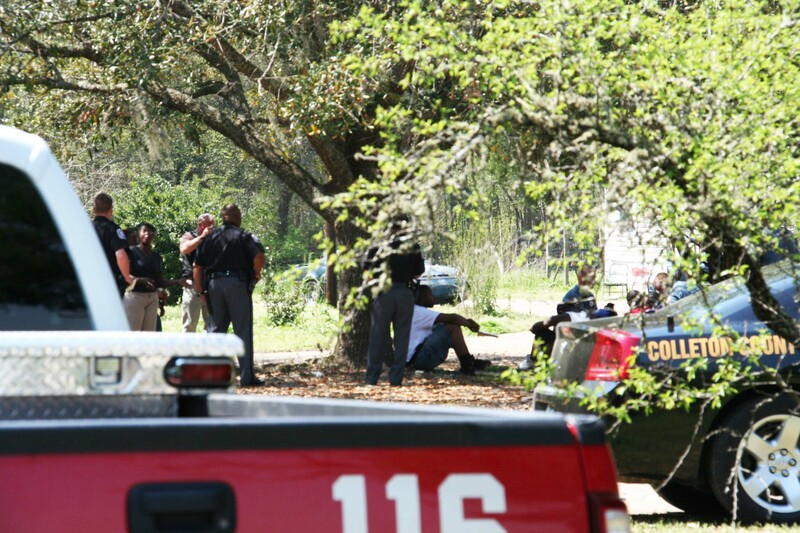 Medic 6, Truck 12 and Truck 116 responded to a shooting incident at 77 Blue House Lane and around the corner at 771 Ritter Road at 1401, Friday afternoon 2-April. The initial report placed the incident with one person injured at 77 Blue House Lane. The patient noted someone shot his vehicle and he received an injury to his hand. Click here for additional information. Stations 5, 24, 26 and 27 responded to a kitchen fire at 450 Knights Ave at 1105 Friday morning 2-April. Engine 26 arrived to report light smoke coming from the single story wood frame dwelling. 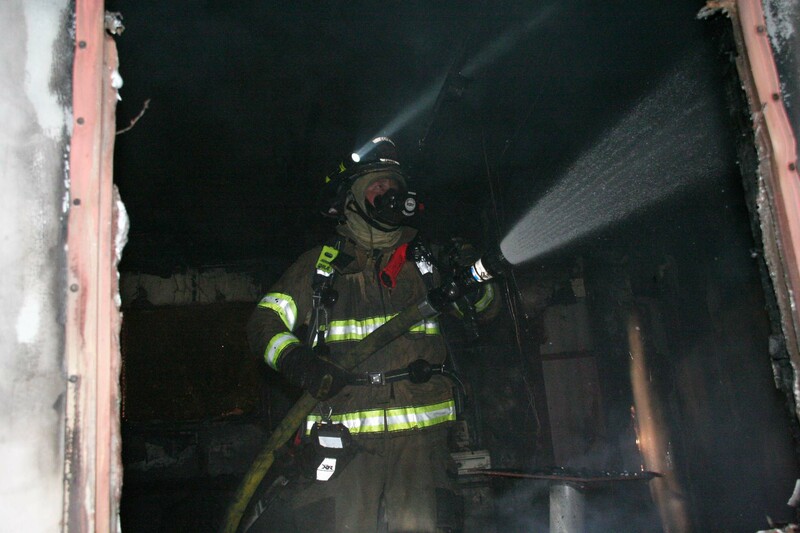 Firefighters deployed one 1-3/4 handline and found a fire inside the stove. It appeared the resident had set the unit to self clean, but forgot some items were inside the stove. Click here for additional information. Stations 5, 17 and 19 responded to a fire in a structure at 245 Prairie Lane near Canadys Crossroads at 1004 Friday morning 2-April. A public works crew who was grading the small dirt road saw smoke coming from the single family dwelling. They alerted 9-1-1. Engine 19 arrived to report heavy smoke conditions in the wood frame building. Firefighters made entry with one 1-3/4 handline. They found the fire in the kitchen near the stove. Click here for more information. 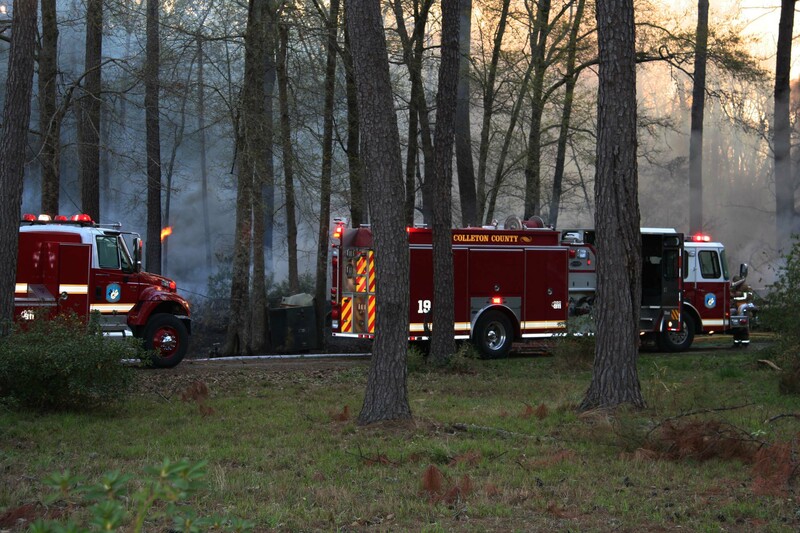 Station 19 responded to a reported woods fire behind a structure at 797 Benjamin Drive at 1834, Thursday evening 1-April. On arrival Engine 19 reported a fast moving woods fire with multiple vehicles involved and one exposure threatened. 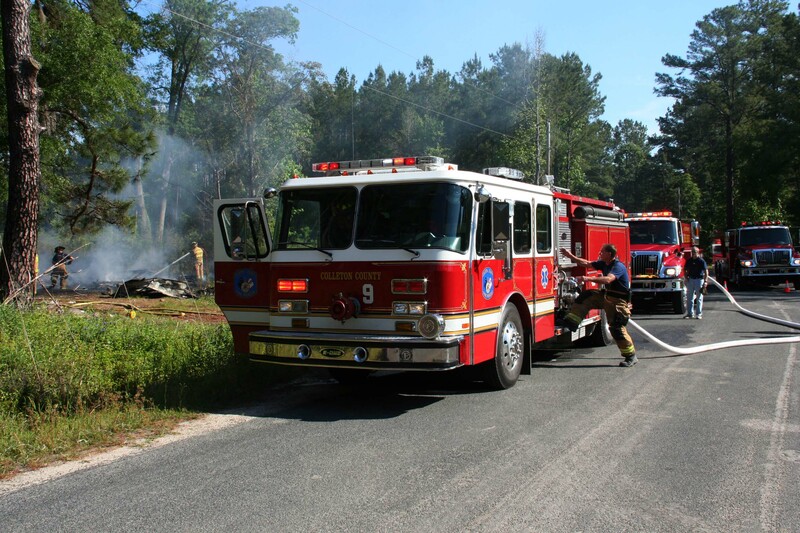 Station 9 was added to the response for Tenders and manpower and tractor from the Forestry Commission was requested. Click here for more information. Congratulations to Engineer/EMT-Intermediate Blaine Harrison for passing his NREMT Paramedic written and practicals. Stations 1, 19, 26 and 27 responded to a five car MVC in the 300 block of Mighty Cougar Drive at 1354, Wednesday afternoon 1-April. 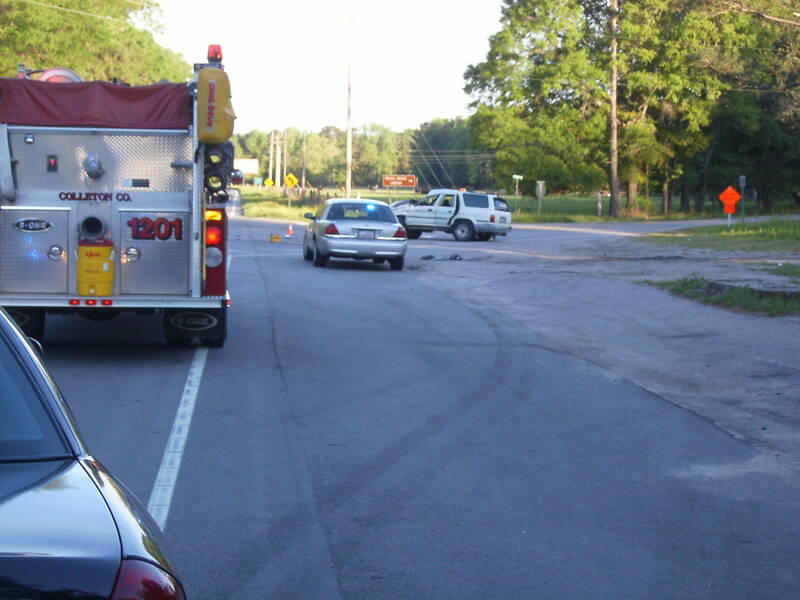 The chain reaction accident occurred after a vehicle rear-ended a line of cars stopped at a traffic light, pushing four other vehicles into the cars ahead of them. Click here for additional information.